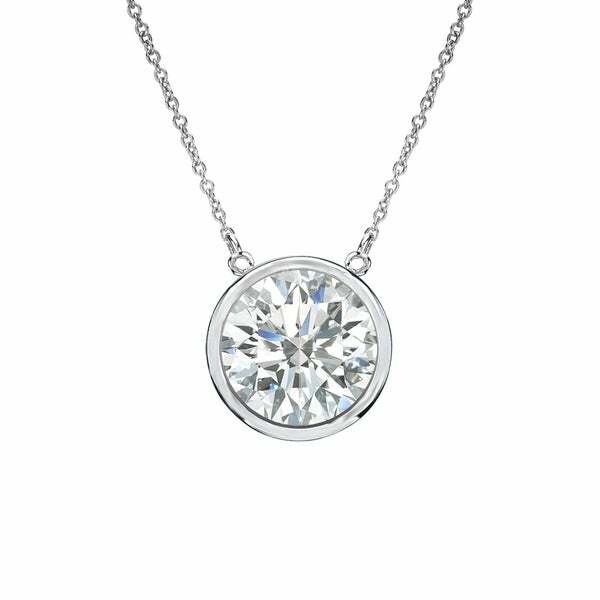 Diamond Bezel Solitaire Necklace by Auriya features a brilliant round 1.00ct. diamond surrounded in a sleek, high-polished 14k gold bezel setting that suspends beautifully from an adjustable 16-18-inch cable chain with a spring ring clasp keeping the diamond centered perfectly and dazzling with brilliance and fire while allowing you to adjust the length for comfort and style. Diamond Solitaire Pendants add the perfect touch to any ensemble and make the perfect gift for any occasion. This stunning yet simple diamond solitaire necklace is crafted in your choice of 14k Yellow Gold, White Gold or Rose Gold that shines bright with a high polish finish. High Value Notice: If security tag is removed, item may not be returnable. Click here for more information.